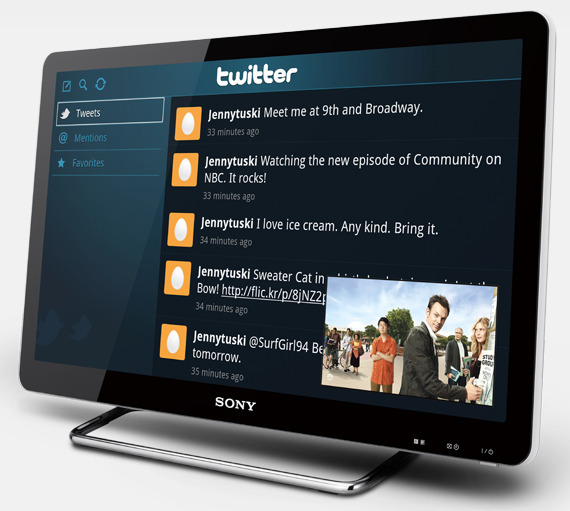 As predicted, Sony unveiled its Google powered TV sets in a press event yesterday (12th October) in New York City. The new sets are all internet based, HD, 1080p edge-lit LED screen devices except the 24″ model which has an LCD screen. All sets come with four USB ports, four HDMI inputs and Wi-Fi capabilities. Available in 24″, 32″, 40″ and 46″ sizes, the smallest 24″ model will cost you $ 599 while the largest 46″ comes in at a steep $1,399. The idea behind internet based TV viewing is to bring the best of both worlds together and provide all the options and functions people are used to online on a TV device. The software provides Hulu, twitter, Netflix, YouTube and Pandora on your Google TV screen with search and web surfing by Chrome and a whole bunch of your favourite Android apps. You can easily integrate the web with your existing cable or satellite TV and search for TV shows and sites on a 46 inch screen. A lot of users may take a little time to get used to the big remote that comes with their Google TV sets. The remote is as big as a PlayStation 3 controller, has a QWERTY keyboard with lots of buttons to navigate through. Once you understand the functions with a little trial and error, the advanced functions are sure to delight anyone who likes the idea of internet based TV viewing. The sets are due to arrive on all Best Buy stores in the US on Sunday and also on SonyStyle.com.